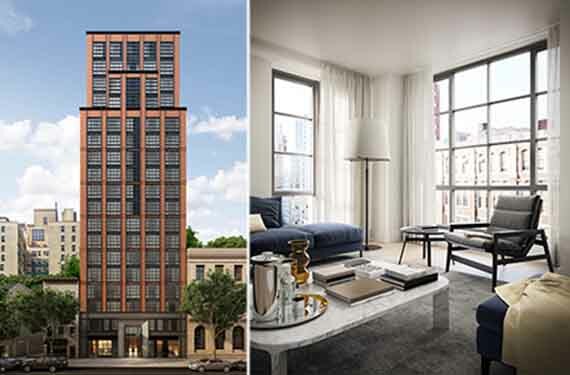 Sales have launched at the Naftali Group’s 234 East 23rd Street. The 20-story building, with amenities and lounge space designed to imitate the feel of a boutique hotel, was developed by the Naftali Group. The property houses 57 luxury condominiums in total. The building is offering up one- to three-bedroom units, ranging from 602 square feet to more than 2,302 square feet. Multiple residents have private terraces, as does the full-floor penthouse. Prices for the apartments start at $885,000 for a one bedroom and stretch to $6 million for a four-bedroom penthouse with private outdoor space. Occupancy is available in the third quarter of 2015. The kitchens feature Bertazzoni, Bosch and Subzero appliances, while the bathrooms are outfitted with marble lined floors and walls, custom casement-style glass doors and custom-made vanity units. Rottet Studio, also responsible for designs in big-name hotels such as the Surrey, New York’s Loews Regency and the St. Regis in Aspen, designed the lobby. The brick and metal structure was designed by Goldstein Hill & West. Alexa Lambert, Executive Vice President of Stribling Marketing Associates, has the exclusive sales and marketing of the apartments.